Recent I got a cream sweater bee in my bonnet. 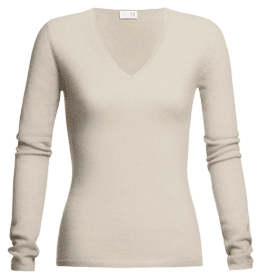 For a couple of months, I have been looking for a cream cashmere sweater of quality that won't break my wallet. The endeavor sounds so simple. How hard it is to find a nice cream color cashmere sweater, right? I really didn't want to spend too much but refused to sacrifice quality as well. Dilemma! I have visited J Crew, Banana Republic, among other retailers and it seems to be not all cashmere sweaters are created equal. I am looking for a cream color that is warmer. Instead I am finding cream colors that look dirty. If the color looks dirty brand new, how is it going to look older. Well, I am looking for a simple cable knit or plain weave. Cashmere pieces are usually pretty pricey so I want to look for classic styles that will last for a few years. I found one at Ralph Lauren but at $475 (image via Saks) Eeeek. I have gotten a few Ann Taylor cashmere and so far those pieces are still pretty nice, even after wash them in water. Yes, I do wash my cashmere. I am hoping to find this in the store. It is 158 online and there is a 50% off promo. Keeping my fingers crossed!! Any tips as to where I can look?? Are you reading my mind? I'm on a wild hunt for a nice creal or white sweater... It is one of my staples and my old one is piling ... Love the one from RL but the price is steep. I could buy a pair of Lanvin flats for that price lol! I was just going to say TSE. Otherwise keep looking at the dept. store outlets - you never know when something great will go on sale! It's surprisingly hard to find good basics! Have you tried looking into recycled cashmere? All the goodness, for cheaper prices!